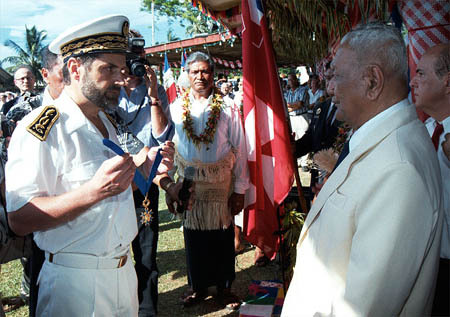 At the Wallis and Futuna website I have found a picture of the King (Lavelua) of Wallis (Uvéa) being decorated by the Prefect of the Territory with the National Order of Merit. The image features a nicely visible Uvéa flag just behind the Lavelua. On the picture, the Tricolour in the canton is bordered white, slightly smaller, and doesn't touch the upper and left edges of the flag (like Alo and Sigave), i.e. it is not properly a canton. I guess this is a mark of subdivision in the Territory. I was wondering if this is only an example of a hasty flag manufacturer? Certainly the flag has some weight regarding the official position it is placed, though it would not be the first case that those who one thinks should know their flag best do not. Željko's remark about the official position of the flag in this protocolar occasion is a fact that cannot be disregarded. Alo and Sigave, which are the two other kingdoms of Wallis and Futuna feature the Tricolour the same way. This flag is the flag of Uvea, better known as Wallis. The name of the whole territory is Wallis and Futuna, but is often referred to as "Wallis", thus creating a potential confusion between the territory itself and one of its subdivision; a confusion that we have already witnessed when people refer to the "kind of Maltese cross French red ensign" as a variant of the flag of Wallis and Futuna, when we know it is just the flag of Wallis island. The confusion is even more likely when we know that the Territory's flag is very similar since it shows a white square on a red ensign, with a red saltire on top... which can look like a Maltese cross. To make this short, I think that the close similarity both in names and flags between the Territory and one of its subdivisions tends to back up the version that the flag on the picture is the right flag for Uvea. According to Lucien Philippe 1999, the Royal standard of Uvea is identical to the 1886 flag, with the Tricolor in canton, as for the other Royal standards. To make things more complicated, there is also an Ouvea island in New Caledonia T.O.M., attached to the Îles Loyauté province. The flag of Uvéa was red with a white cross (similar to the cross of Malta, several shapes of it are known), basically the current unofficial flag of the territory. When the French protectorate was established, the tricolour was added to the canton. Originally a red flag with a white cross pattée was used in the 19th century in Uvea. The cross was introduced by the first Marist Brothers, the French missionaries who established the missions. When, in 1886, the Queen of Wallis accepted the French Protectorate it was agreed to charge the canton with the French Tricolore.